In my last post we had just arrived at Machu Picchu, the culmination of 4 days trekking through the Andes along the famed Inca Trail. Pain, Sickness, Tragedy, Joy, Fear, Apprehension, Appreciation, Wonder, Awe, Altitude Sickness, all of these things and more, we experienced. Although in fact, by the time we arrived to the Famed Lost City, we had actually been in Peru for 10 days, we still have several more to go before our adventure is done. I will be sharing the last days of our trip in the future as well, as we went back to Cusco and Lima. I am looking forward to sharing some of our time in Lima, the last time we were there was only there for 24 hours. On our second visit, we spent several days in the city seeing some spectacular things. 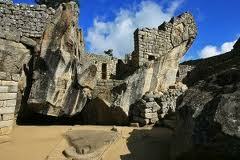 However I want to finish up with some things about Machu Picchu and the surrounding area. 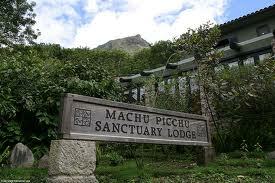 As you know we stayed one night at The Sanctuary Lodge in order to spend a second day at Machu Picchu. After all the work it took to get here, we simply did not want to be rushed through this tremendous find. The Sanctuary Lodge is a very old lodge that sits just outside of the official entrance to Machu Picchu, up on the mountain. It is not the most luxurious hotel in the world that is unless you have just been walking for 30 miles through the Andes, then you really believe it is THE most luxurious place in the world. When we booked this trip, we were encouraged to stay here because of it’s proximity to Machu Picchu, we were told that it will add significant cost to the trip, about $700 ( in a future post I will share what this adventure cost us ) for the night what they did not tell me is that it would be all inclusive. It was worth every penny. For starters, it is in one of the most beautiful locations in the world. After coming off that Trek, the ability to have a great room with a beautiful view, hot shower, perfect bed and all the food and drink you can possibly handle. We settled in the bar after returning from Machu Picchu around 2 in the afternoon to try out the all you can drink capabilities. A couple of hours later I was napping like a baby that hadn’t slept in 2 weeks. 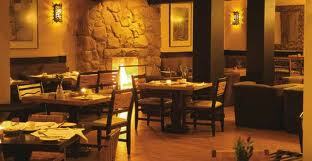 When we joined our group for dinner, it was fantastic. The food was outstanding, 4 star anywhere else, and the Wine, I believe we went through nearly 10 bottles, there were 8 of us after all. And not a bill in sight after we finished. My previous post included a slideshow of Machu Picchu, I hope you took the time to watch it. But there are some very specific and fascinating things about the Famed City that I found to be absolutely stunning. For one, the stone work. The workmanship to build the city on stone from surrounding areas is remarkable. 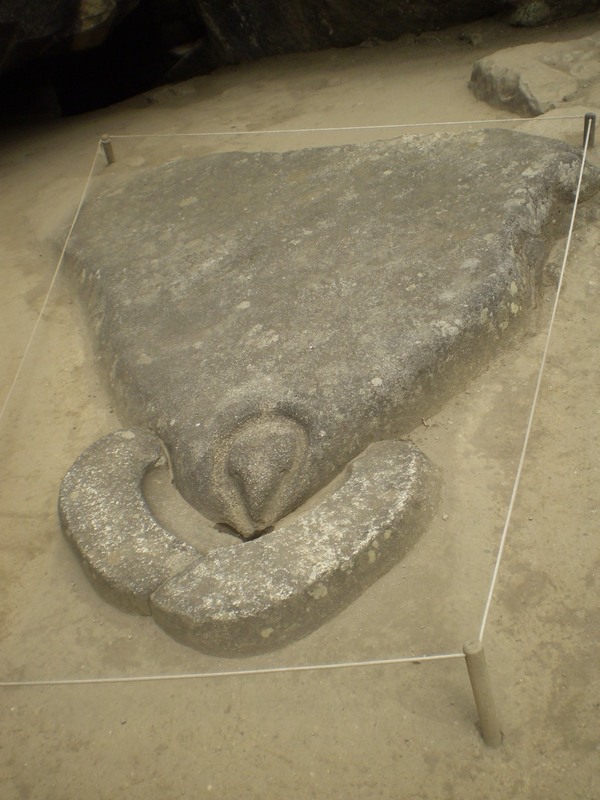 It is important to remember that the Inca, worked the stones with primitive tools to shape them. In most cases if you look real close you can see just how much work it must have taken to do this. One other thing that is fascinating is that most of the buildings are built without using any mortar or other means to build walls etc. The stones are hand cut to fit their specific location. The stone work is downright amazing. Although the buildings are all built with stone from the surrounding area, the type of stone work signifies differences in the buildings and what the buildings were used for. The building that the Inca King, the Royal Family and the High Priests were built using only the finest stones, and workmanship. There isn’t any mortar being used to keep these buildings together. And yet, they have been standing for 100’s of years. These two stone walls are part of the same wall. 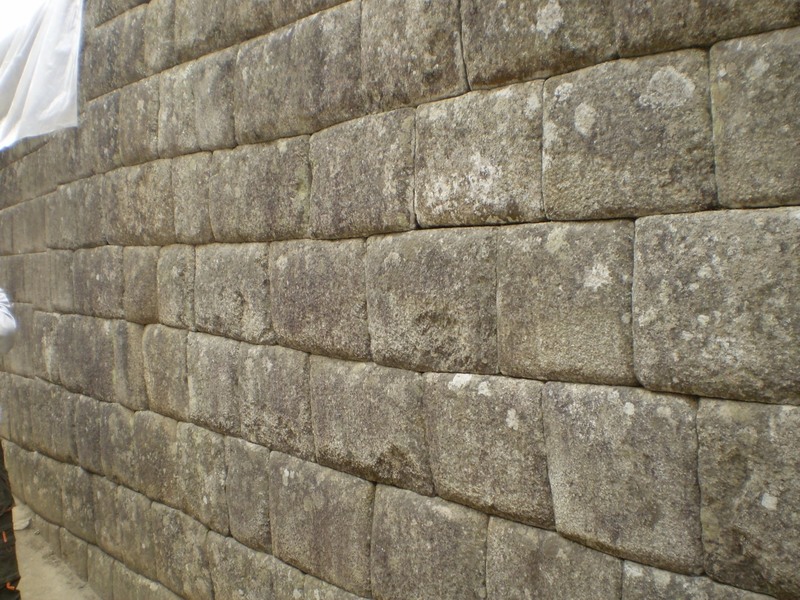 But if you look closely, in one part of the wall the stones are not as smooth, and precisely cut. 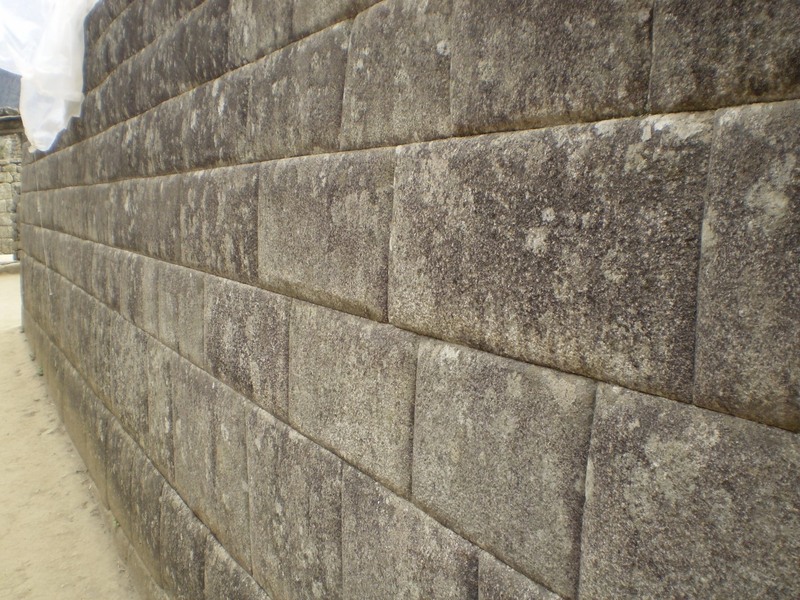 While the other half of the wall, the stones are very precise, smoother, and very close in size. The side of the wall that these stones are used for create the wall of a High Priests home. 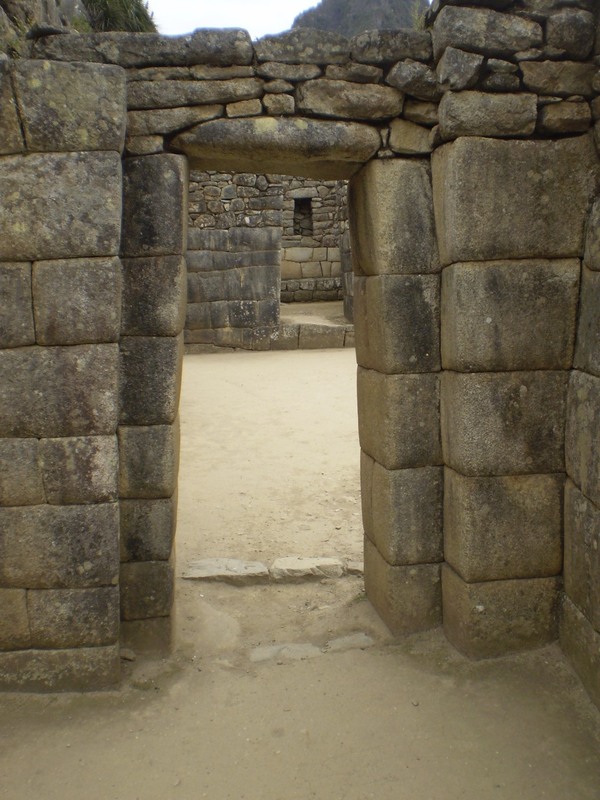 As mentioned earlier, Inca doorways, windows, and wall niches are trapezoidal. Some were simple, but elegant. The finest doorways, called “double jamb doorways”, have a recessed lip several inches wide inside the outer trapezoid. This inner lip was, in most cases, a design element that indicated an important doorway to a high status site such as a religious or royal site. Such a jamb might also have facilitated the emplacement of a wooden door to close the opening. That doors were used to close some Inca doorways is indicated by a variety of carved stone devices apparently used to hold a door in place. Simple stone rings carved in both sides of doorways probably were used to tie a bar or other largely symbolic barrier in place, to indicate a closed area. 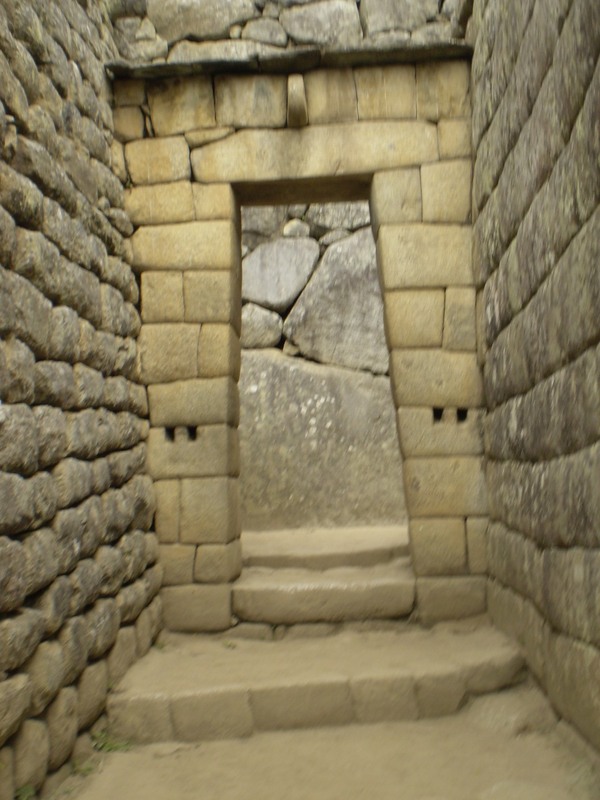 While no original wooden doors have survived the nearly five centuries since the collapse of the Inca empire, elaborate closure devices associated with numerous important entries and gateways appear to have been used to hold real doors in place. 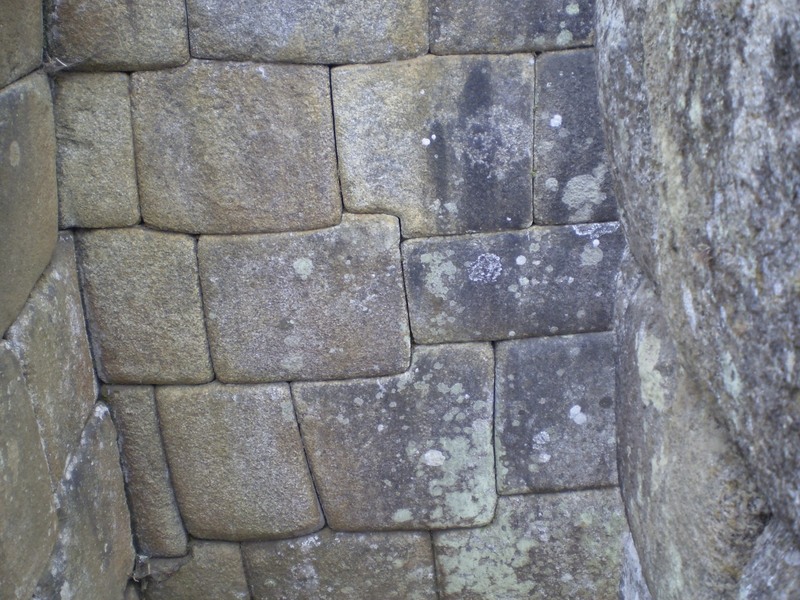 One of the best examples, featuring a stone loop above the doorway, and two barholds consisting of stone cylinders fixed in niches on either side, is the principal gateway at Machu Picchu This portal opens through the main wall of the Royal Estate, and clearly was meant to have a defensive door that could be sealed in place with ropes, and braced, if need be, with heavy beams. The sides of trapezoidal windows might be built up with ashlars with one end cut to a gentle slant to conform with the trapezoid sides, and capped by a long stone for a lintel. 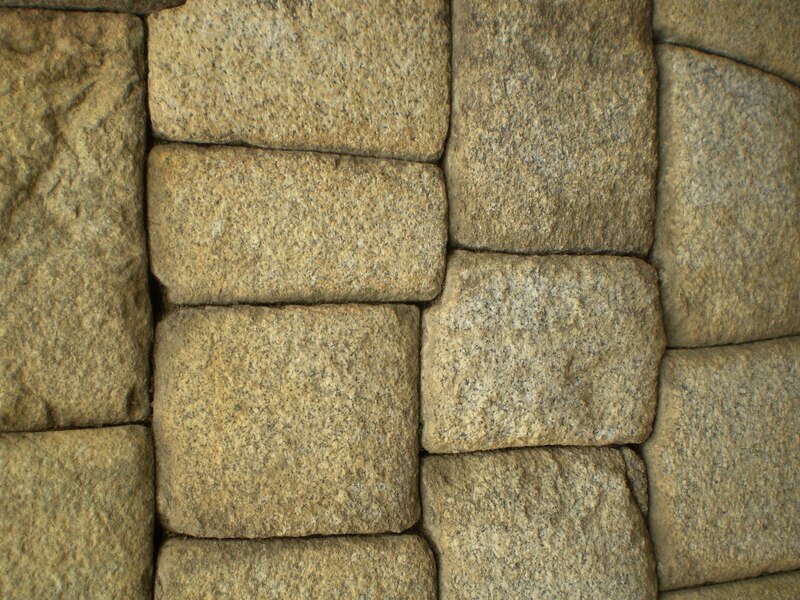 And they could be framed with specially shaped stones cut and fitted “cyclopean style”, as in the case of the “Three-Windowed Temple” at Machu Picchu. We arrived at 7:30 in the morning, and thankfully there was no where near the amount of people here that were yesterday afternoon. By no means were we alone, but there were so few people that the silence, peacefulness and serenity were outstanding. It was like entering a beautiful Cathedral, quiet and respectful. Unfortunately it won’t last long, as more and more people would arrive throughout the day. They say that nearly 2000 people enter Machu Picchu daily, I can assure you that the majority didn’t get there the way I did. As the day went on, it was interesting to see how many people suffered trying to get around the city. I don’t think they really knew what to expect, there is very little flat land, there is a lot of climbing that has to be done to get around and at the high altitudes, it was tough for many. Machu Picchu is at @ 8000 feet, it was nothing for us, but we had already been as high as 14,000 feet just a couple days earlier. 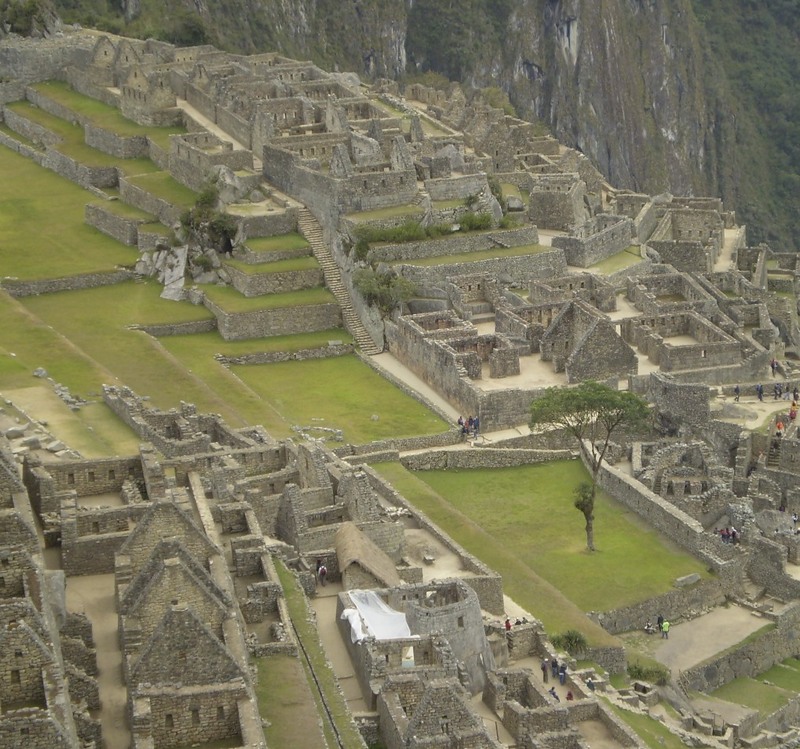 It is stunning how the Inca built the city, literally terraced on the side of a mountain, and spread out over 30 acres. Machu Picchu itself is in the shape of a Condor, one of the Inca Deities along with the Water, Sun, Snake and Puma (Cusco is in the shape of a Puma). Many of the buildings walls are built on a slant of roughly 13 degrees, this is to help resist failure during an earthquake. The Condor Room, see the wings, the Condor’s head? I only wish I could have taken one great picture of this whole space, it just wasn’t possible due to it’s huge size. The Condor Room was used for Religious ceremonies for the upper class. Under neath the Condor Room was a serious of hidden spaces and small rooms where Bodies were held prior to their burial ceremonies. And yes, this room was used for sacrificial services to the Gods. Along the “wings” of the Condor are niches that were used to hold mummified remains. 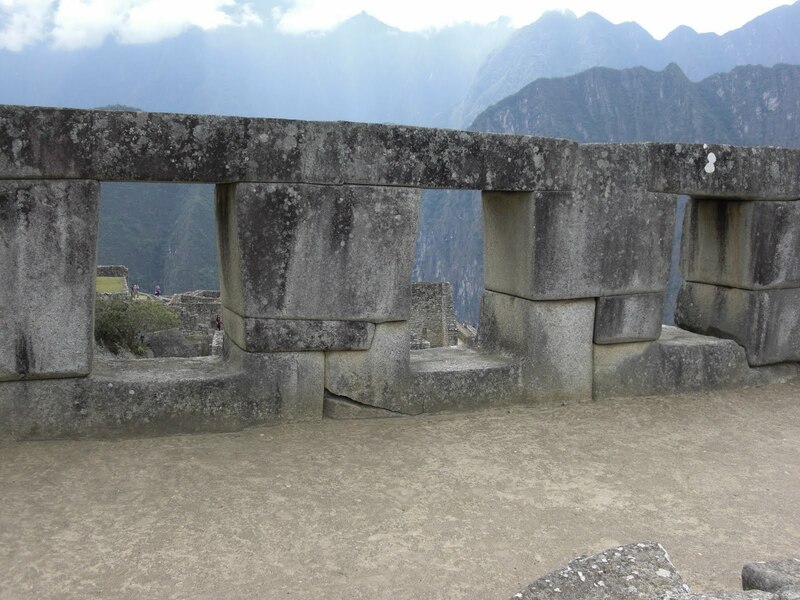 The remains would be put in these niches for the ceremony, to “Lift them on the wings of the Condor” to heaven. Pictures can not do this place justice, it really is an amazing and awesome place, there is a spirituality that exudes from this particular room. In the pictures above, you will see the “Head” of the Condor. This is in the ground at the base of the wings and was used during the Sacrificial Ceremonies, if you look closely you will see at the beak that there is a hole in the ground, this is where the blood would have run. We are running out of time, it is now 10 a.m. and we have to get back to The Sanctuary Lodge to catch a bus to Aquas Caliente. From here we will catch a train back to Cusco. In an upcoming post I will tell you about our experience in Aquas Caliente and the Train.